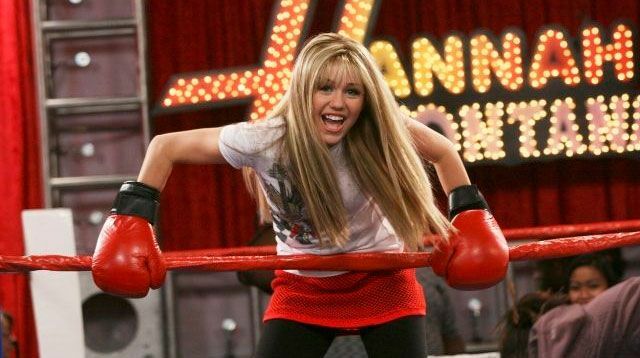 Miley Cyrus was surprised with a throwback video of her Hannah Montana audition tape—one she seemed to enjoy, calling the unearthed footage "a gem." The 24-year-old singer was promoting her new single "Malibu" at Radio Disney when she was shown the archive clip of her 11-year-old self impressively belting out a song titled "We're Going To The Beach." During the clip a very young Miley sings a line about a bikini at which the older Miley quipped: "Always a little controversial, from the beginning." She then pointed out: "By the way, my t-shirt says "I should have my own TV show." That is so funny. That is crazy. That is a jewel. That is a gem." In the video, Miley is asked about her "I should have my own TV show" t-shirt, before she confidently announces: "It's going to happen." The star has previously admitted that playing pop princess Hannah Montana gave her severe body dysmorphia, telling Marie Claire: "I was made to look like someone that I wasn't, which probably caused some body dysmorphia because I had been made pretty every day for so long, and then when I wasn't on that show it was like, 'Who the f**k am I?'" But she recently added that despite feeling "disconnected to who I was at the time, I will always feel eternally grateful for the opportunity and platform I was given." Miley released her brand new single "Malibu" last week, which is a tribute to fiancé Liam Hemsworth.